Portals in the Heretic's Abode. The Infernal Machine is an end game quest feature introduced into Diablo 3 in the v1.0.5 patch and changed in Patch 2.3. Prior to patch 2.3, the Keywardens would drop keys and the player would need one of each to craft one machine. Now, the Keywardens drop the machines directly. The Machines are used to open red portals to special dungeon areas where Ubers, super powered versions of certain quest bosses, must be defeated. These Ubers have a chance (increasing with difficulty level) to drop a Demonic Organ. Once a player has collected all 4 demonic organs they can be crafted into a Hellfire Ring or a Hellfire Amulet by the Jeweler. Players without Reaper of Souls will only be make a version of the Hellfire Ring. Infernal Machines only drop on the Torment difficulties. Diablo 2's Pandemonium Event is the obvious inspiration for this end game event. 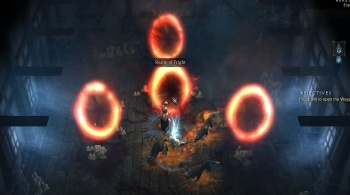 In Reaper of Souls there are 4 different types of Infernal Machines, each of which produces a known Portal, making it possible to hunt each Demonic Organ specifically. To use the machine, go to the Hermit's hut in New Tristram (its in the north). This page was last edited on 10 September 2015, at 13:12.